Add a poisoned weapon using Attack Status Effects, or a toxic enemy using Defence Status Effects. Attack and defence status effects are just another way of doing status effect changes automatically when using an ability or item. While you can just add those changes to the ability/item directly, you might want to give a weapon a poison effect when it’s used to attack without setting up a completely new attack for the weapon. Attack status effects will use the effect changes of the user of an ability/item on the target. Defence status effects will use the effect changes of the target on the user. Both can be added to classes, combatants, passive abilities, equipment and status effects – allowing a wide variety of gameplay mechanics. A weapon that will add the Poison status effect on the target when used in physical attacks. 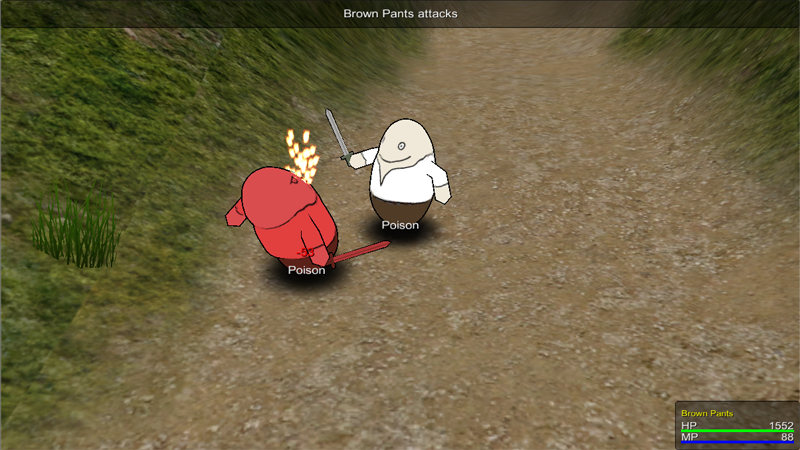 An enemy that will add the Poison status effect on the attacker/user when being physically attacked. Open the ORK Framework editor and navigate to Inventory > Weapons, copy the Short Sword and change the following settings. Click on Add Status Effect to add an attack effect to the weapon. And that’s it for the new weapon. Don’t forget to enable the weapon in the player’s class, otherwise he wont be able to equip it. Navigate to Combatants > Classes, select Player Class and change the following settings. And that’s it for the class update. We’ll base Toxic Pants on Evil Pants – navigate to Combatants > Combatants, copy Evil Pants and change the following settings. Click on Add Status Effect to add a defence effect to the combatant. And that’s it for the new combatant. Now, all we have to do is allow using the attack and defence status effect changes in all our physical attacks. Navigate to Status > Abilities and change the following settings in the Attack and Mug Attack abilities. And that’s it – click on Save Settings to save the changes. Now, when equipping the Poison Sword, the targeted enemy will additionally be poisoned, even if the attack itself doesn’t give that effect. Also, when attacking Toxic Pants with an attack, the attacker will be poisoned as well.